In general, galaxies can be thought of as "social" — hanging out in groups and frequently interacting. However, this recent NASA/ESA Hubble Space Telescope image highlights how some galaxies appear to be hungry loners. These cosmic oddities have set astronomers on the "case of the missing neighbour galaxies". Located half a billion light-years from Earth, ESO 306-17, is a large, bright elliptical galaxy in the southern sky of a type known as a fossil group. Astronomers use this term to emphasise the isolated nature of these galaxies. However, are they like fossils — the last remnants of a once active community — or is it more sinister than that? Did ESO 306-17 gobble up its next-door neighbours? Gravity brings galaxies together and bigger ones swallow smaller ones. There is evidence that our own Milky Way galaxy has "snacked" on numerous smaller galaxies that strayed too close. ESO 306-17 and other fossil groups may be the most extreme examples of galaxy cannibalism, ravenous systems that don't stop until they've devoured all of their neighbours. In this image, taken by the Advanced Camera for Surveys aboard Hubble in the summer of 2005, it appears that ESO 306-17 is surrounded by other galaxies, but the bright galaxies at bottom left are thought to be in the foreground, not at the same distance in the sky. In reality, ESO 306-17 lies fairly abandoned in an enormous sea of dark matter and hot gas . When zooming in closely on ESO 306-17, one can see faint clusters of stars through the bright shine of the galaxy's large halo. These are globular clusters — tightly bound groups of stars that can often fend off cannibalism from larger, "bully" galaxies. Studying these surrounding clusters will prove helpful to astronomers in their pursuit to put the pieces of ESO 306-17's history together. Researchers are also using this image to search for nearby ultra-compact dwarf galaxies. Ultra-compact dwarfs are mini versions of dwarf galaxies that have been left with only their core due to interaction with larger, more powerful galaxies. 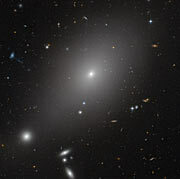 Most ultra-compact dwarfs discovered to date are located near giant elliptical galaxies in large clusters of galaxies, so it will be interesting to see if researchers find similar objects in fossil groups. Studies conducted by both ESA's XMM-Newton mission and NASA's Chandra X-ray Observatory have confirmed the existence of hot gas surrounding ESO 306-17.